Preeclampsia can sneak up on the healthiest of women, but it can be treated if caught in time. Lisa McKinney figured that she was the perfect candidate for a trouble-free pregnancy. "I was so healthy. I went hiking, ate right, gave up coffee. I was enrolled in a prenatal fitness class. I took water aerobics. And still I got it," she says. It was preeclampsia, a mysterious and serious complication of pregnancy as old as history and still not well understood, despite major new studies to try to figure out its cause and to find ways to prevent it. Preeclampsia is the leading cause of maternal death in developed countries, says James M. Roberts, M.D., one of the top researchers on the disease in the United States and director of Magee-Women's Research Institute in Pittsburgh. The disorder is related to a problem with the placenta—specifically, constricted blood vessels that reduce the blood supply to it—and is usually marked by a trio of symptoms: high blood pressure, protein in the urine and swelling of the face and body. It used to be called toxemia because there is a buildup in the blood of substances seemingly related to the condition. The untreated extreme phase is called eclampsia and has been associated with seizures and, in rare cases, death. The only preventive is to be checked early. McKinney, then 31 and pregnant for the first time, had no idea she was developing preeclampsia until she was 31 weeks pregnant and her blood pressure started creeping up. Her doctor recommended the standard treatment: lots of bed rest. That worked for a while, but McKinney developed protein in her urine, signifying that her kidneys might not be functioning properly and that her condition was worsening. Her doctor hospitalized her. "I felt fine," McKinney insists. After being sent back home she developed placentia abruptio, separation of the placenta from the uterus; she had to have an immediate C-section. Yet after her baby was born, her preeclampsia quickly progressed to outright eclampsia—a dangerous escalation that doctors can't predict. McKinney's kidneys almost failed, and she teetered on death's edge. Tiny Samuel McKinney, born at only 3 pounds, 14 ounces, was in the hospital for six weeks with numerous problems because he was so premature. "Infants born to women with preeclampsia have a fivefold increased chance of dying compared to women who don't have it," says Roberts. The main cause is that not enough blood has reached the placenta. The condition also accounts for about one-third of premature deliveries, he says, because the ultimate cure for preeclampsia is delivery, either through a scheduled early C-section or induced vaginal birth. Although some experts believe that large doses of calcium may help reduce the chances of developing preeclampsia, a recent study of more than 4,500 pregnant women sponsored by the National Institutes of Health showed that calcium had no effect on preeclampsia risk at all. 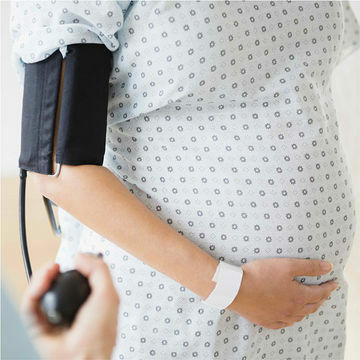 No known preventions for preeclampsia exist, but for now, with careful monitoring from an obstetrician-gynecologist, it can be treated.